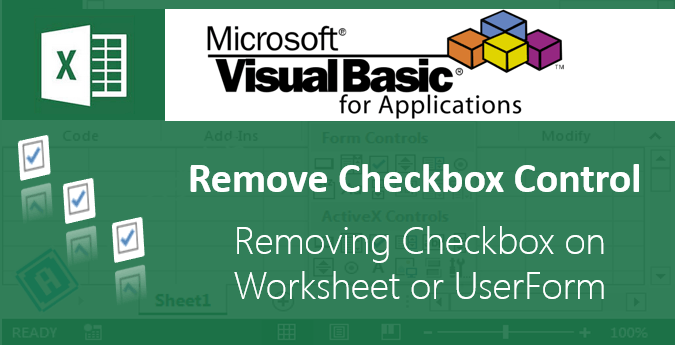 VBA Remove Alpha Special characters from Range helps to remove unwanted characters and numbers from a selected Range . 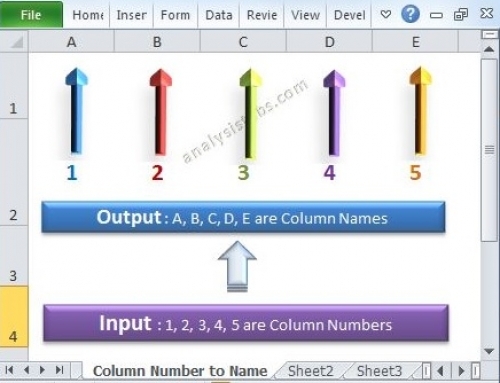 For example, user has to enter the non alphanumeric characters in a Cell or range. We need to do data validation whether user enters non alphanumeric or not.If user enters also, we need remove those alpha characters from cells using excel VBA. First of all we need to check whether entered data in a cell is alpha characters or not. If it is not with using following code we can remove those alpha characters from cell. Following are the two different methods. 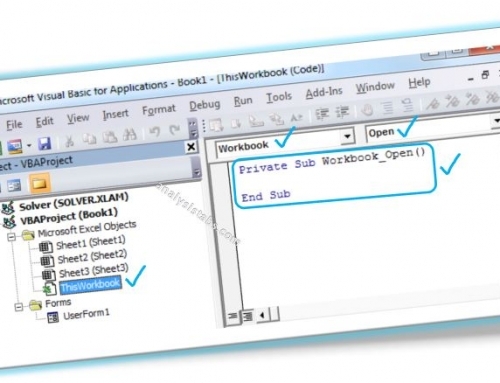 Here are the examples to show you how to remove the alpha and special characters from data. Following are the two different methods, the first one is a procedure to remove alpha and special characters from a specific range. And the second one is the user defined function to remove the alpha and special characters from Cells. 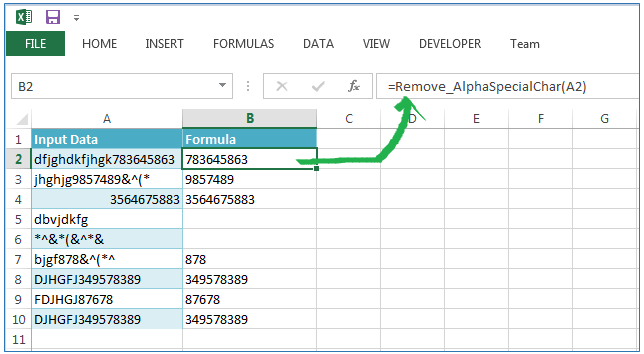 Following is the example to Remove Alpha Special characters from cells in a selected Range using Excel VBA. 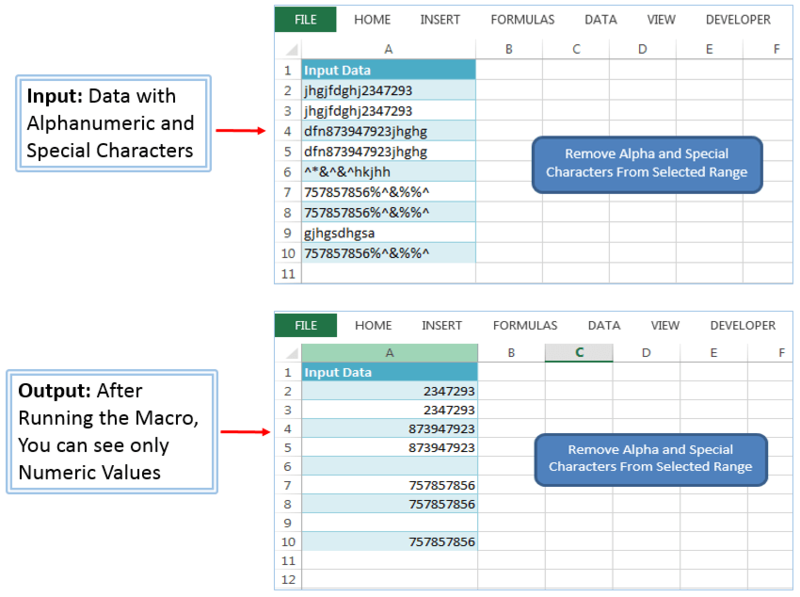 If Mid(IpData.Value, iCnt, 1) Like "
Following is the one more example to Remove Alpha Special characters from cells in a selected Range using user defined function with Excel VBA. 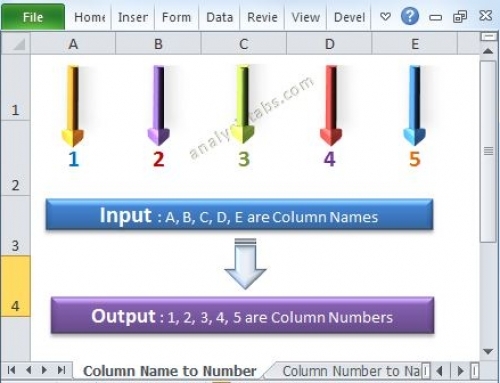 Here is the screenshot for showing User defined function to remove Alpha and Special Characters from the cells. 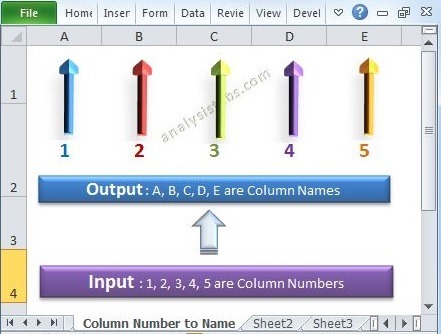 Now you should see only numeric data at B2, You can drag the formula upto B10. 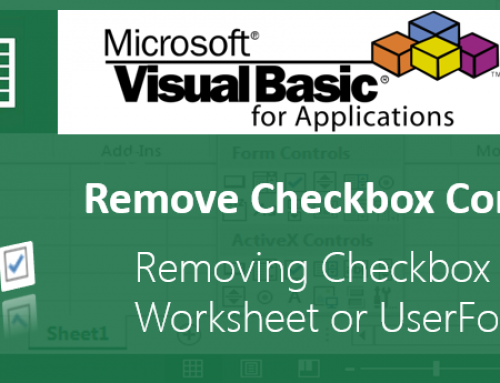 Please find the Example File to download, you can explore the code to see how to remove the alpha and special characters from a data using Excel VBA.